This is a recipe for Asian Sloppy Joes. Next time you’re in the mood for Sloppy Joes, think outside the box and try this Asian version. Hoisin, lime juice and Chili Sauce are just the beginning of a great lineup of flavors. Easy fixings for your next party crowd. One Saturday afternoon last Fall, we were browsing PBS and came across a quite curious scene. An Asian chef was working furiously over a stove packed full of woks, pressure cookers and sauce pans, all of them steaming, sizzling, smoking or hissing at full speed. Standing alongside the chef were mom and dad smiling proudly and amidst the chaos the three were cheerfully reminiscing over family cooking memories as chef furiously stirred, shook and shifting pans from burner to burner. During this juggling act, chef even took the time to tudor us about the safety of modern day pressure cookers. The Chef was Ming Tsai, owner of Blue Ginger Restaurant. Ming was raised in Dayton, Ohio, where he spent hours cooking alongside his mother and father at Mandarin Kitchen, the family-owned restaurant. In 1998, Ming opened Blue Ginger in Wellesley, MA and introduced his innovative East-West cuisine. I don’t remember what he was cooking that day on television, but I did know I wanted to research the Pressure Cooker he was using on the show. But that search saga in its self is for another blog post. So What’s That Got To Do With these Asian Sloppy Joes? In mid-January, when Super Bowl recipes were filling up my email, I spotted this one that came over from Food and Wine Magazine. I subscribe to their “daily recipe” feature. The recipe caught my eye and then I noticed it was the same Ming from the simmering, steaming, smoking, hissing stove top show I had watched last fall. I had to give these Asian Sloppy Joes a try. Here’s the lead-in description for the recipe. Star chef Ming Tsai’s Asian-accented sliders are based on a recipe his mother made for him when he was young. “Everyone at school wanted them, so I’d usually trade a little slider for a complete lunch,” says Tsai. These didn’t end up on my Superbowl menu, but the weekend before we enjoyed these wonderful little treats. It’s a really good recipe and a change up from our traditional American version of Sloppy Joes. Don’t forget the pickle, it really adds to the experience. I hope you give these Asian Sloppy Joes a try, and if you do, please come back and give the recipe a star rating. And leave a comment about your experience with these little sandwiches. 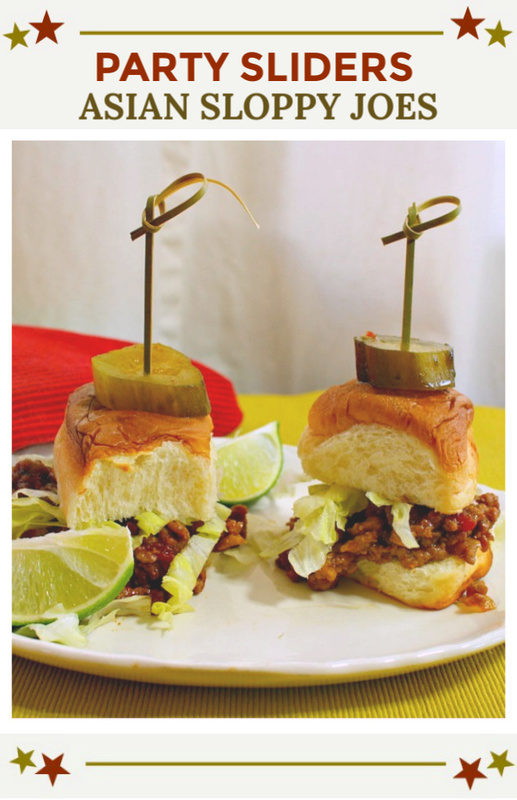 And if you have a favorite Sloppy Joes recipe, let me know, I’d love to give them a try. I’m sharing this recipe over at Meal Plan Monday … check it out. This is a recipe for Asian Sloppy Joes. Next time you're in the mood for Sloppy Joes, think outside the box and try this Asian version. Hoisin, lime juice and Chili Sauce are just the beginning of a great lineup of flavors. Easy fixings for your next party crowd. In a large, deep skillet, heat the canola oil until shimmering. Add the onions, celery, chile sauce, garlic, ginger and a generous pinch each of salt and pepper and cook over moderate heat, stirring occasionally, until the vegetables are softened, about 8 minutes. Add the ground chicken and pork and cook, stirring occasionally to break up the meat, until no pink remains, about 5 minutes. Stir in the hoisin, tomatoes and lime juice and bring to a boil. Simmer over moderately low heat, stirring occasionally, until thickened, about 20 minutes. Season with salt and pepper. Spoon about 1/4 cup of the sloppy joe filling on the bottom half of each roll. Top with shredded lettuce and pickles and serve. MAKE AHEAD The sloppy joe filling can be refrigerated for up to 3 days. Reheat gently before serving. These sound divine Lea Ann. I love sliders. They sound delicious Lea Ann and your presentation makes them look even more so. Great shot. This is such a meaningful post to me because Ming Tsai and sliders are a long running joke in my family that dates back to 2007 when I competed in an Ocean Spray Cranberry Cook-off. My recipe was competing against some really delicious turkey sliders. Ming Tsai was at the awards/cocktail reception and after several cocktails kept telling me how much he loved those sliders thinking I had made them. Well, sure I had lost, I was totally bummed until I was announced the winner. I’m just so thankful that he wasn’t a judge because that man loves his sliders. You would certainly make him proud with these Lea Ann. I must admit that they do look delicious. Love this story Karen. I had no idea he was “slider guy”. I would love to taste these. Ginger is such a delicious flavor. Beautiful photo, too! The ginger really stands out in this. Thanks for the compliment on the photo. I really think I should have removed the bun on one of those sliders, to show the meaty goodness. I’ve watched Ming’s show on television. I love Asian flavors and would love to try these sliders. They look wonderful and the ingredients sound so good together. Susan, I’ll have to find his regular show and start watching. Wow, that is all kinds of crazy good. A lot of effort and care taken with this, it’s almost a shame to call it a sloppy joe since it is worlds away from that slop they served in grade school, lol. They’re really good Anshi. As always thanks for stopping by and the comment. No pressure cooker for this one, heh. Sliders have to be one of the funnest foods on earth. The Asian version is great and I wouldn’t dream of eating it without a pickle! BTW I have an electric pressure cooker that I LOVE! I agree Rhonda. Sliders are the best. Thanks to Ming, I have a stove top pressure cooker now. Santa brought it to me. I’m still getting used to it. Nice to have an Asian take on sloppy joes for a different change of pace. I agree Karen. This was a nice recipe.